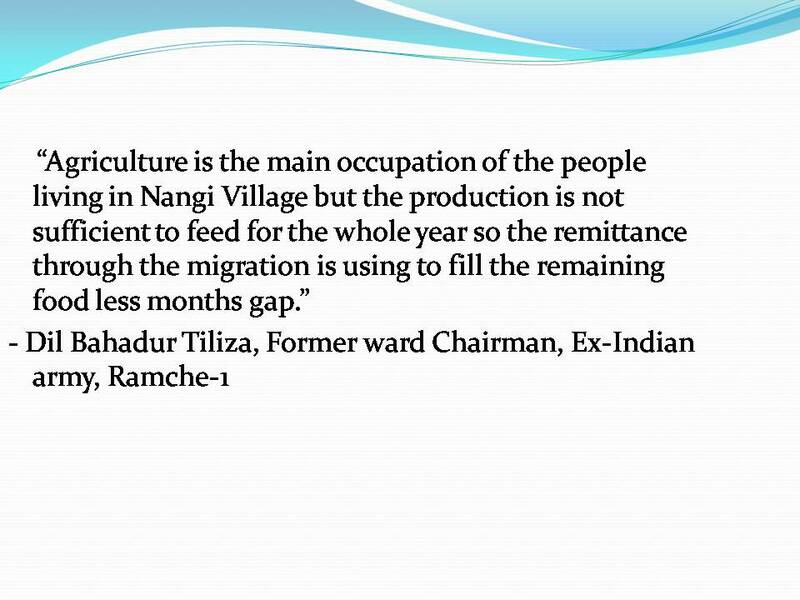 Trend of migration has been an inherent feature of Nangi village. 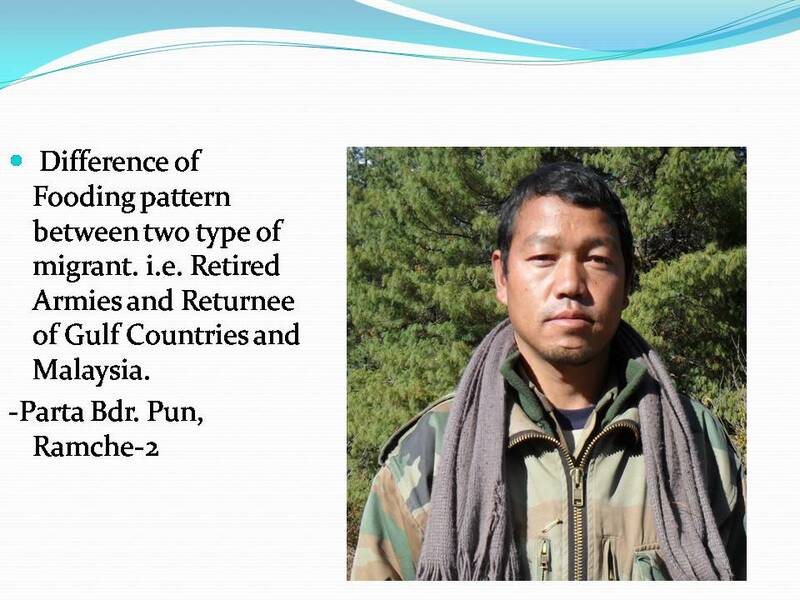 While the families of persons employed in foreign military services widely migrated to urban areas in the past to meet their living standards, in recent times, engagement in foreign employment has been the prominent feature of migration. Most of the households have sent their members to work as wage laborers in countries of the Gulf and Malaysia. 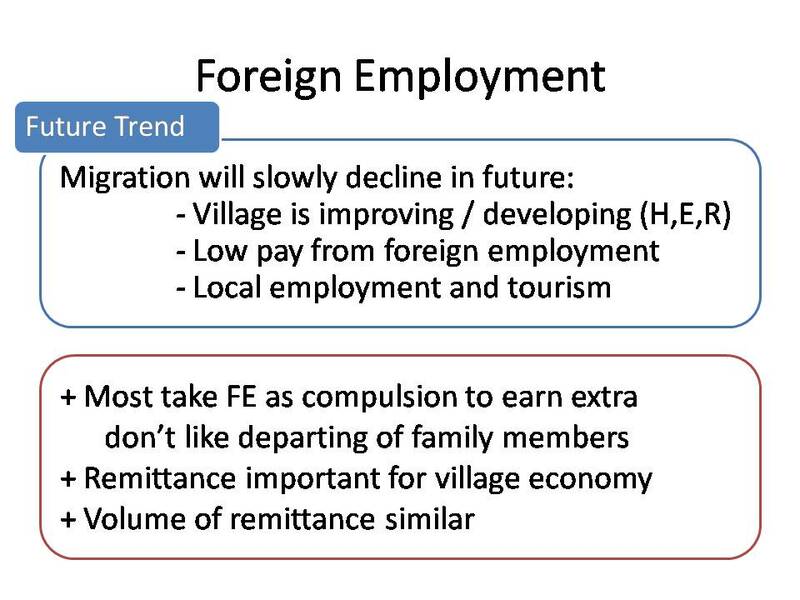 Limited agricultural productivity and scarcity of employment opportunities in the village have prompted migration of people in search of foreign employment. 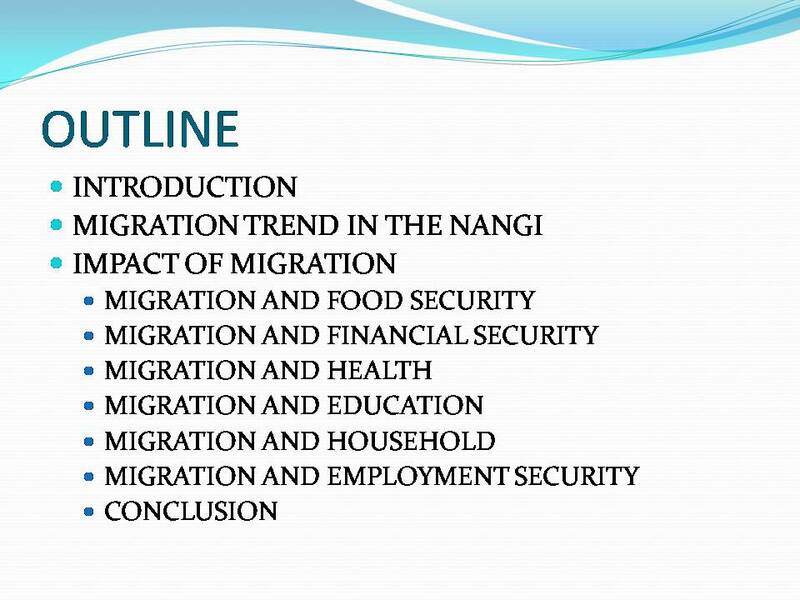 In general, migration can be said to have beneficial impacts in the lives of the people at Nangi and have been found to secure food security, financial security, employment security, household security and education and health for the villagers. 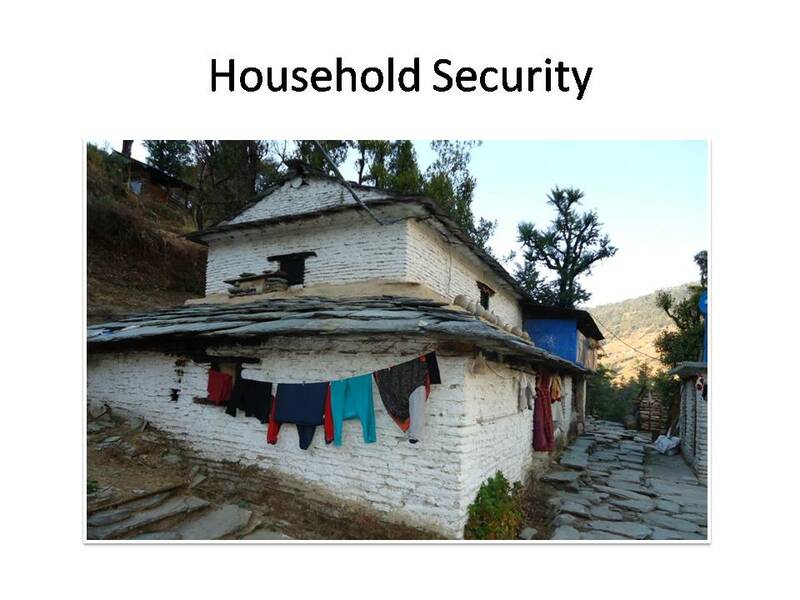 Had the migration been limited, most of the households would have faced insecurity of livelihoods. People’s migration has resulted in shortage of labor as well the amount of land is being barren in the village that has adverse impact on the productivity and increased dependency on the remittance income to buy other food items from the nearby market of Beni and Pokhara. Remitted income coming in the family has resulted in different consumption pattern among villagers. To give example Ex-British or ex-Indian army were found to be indulging in alcohol consumption and have less concern towards investment in local agricultural production while gulf-countries migrants were more spending in food and education. 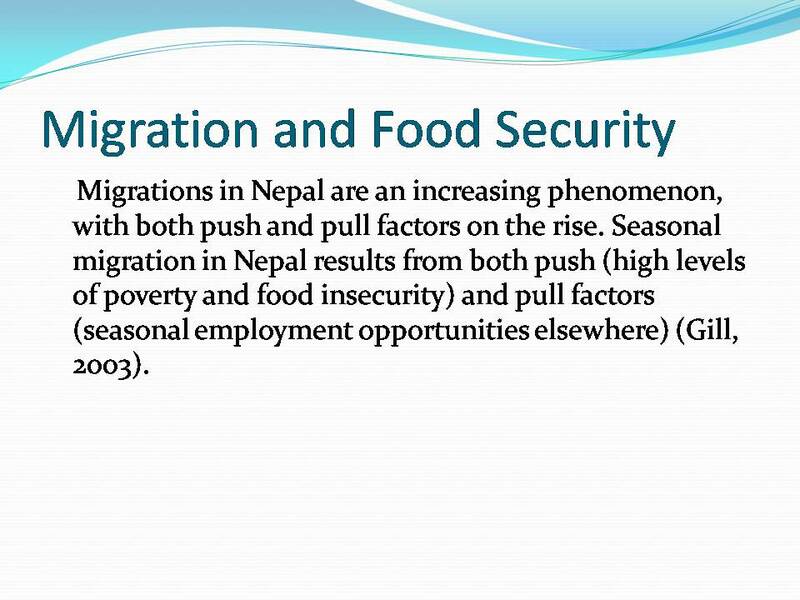 However the migration has both positive and negative impact on the people’s livelihood including food security aspect. Migration seems to have positive i mpact on the education level of the villagers in many ways. First the contribution of ex-migrants for founding the base of education in the village and then secondly the villagers are spending the remitted income to educate their children either in village (greater in number) and or in nearby cities like Pokhara and Beni (very few). The absence of husbands or sons in the family tends to have effect on the performance and health of the children too. The health of the migrants was not found to be good neither their family members in the village were having motivations to visit the health posts frequently. The process of migration has however encourage the households to consume nutritious food items and incase they face some big health emergencies, they were found to be able to cope with that only with the remitted income. Besides agriculture, foreign employment has been serving as the major economic backbone of the village and remittance has played a significant role in securing basic needs of the villagers. 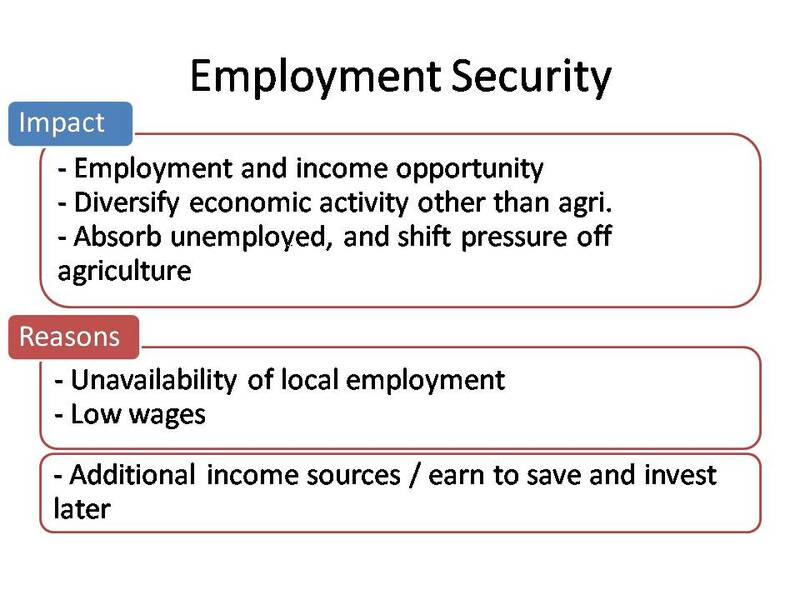 It can be inferred that migration (foreign employment) is a crucial factor for providing employment as well as income opportunities for households of the village. Never-the-less many issues still concern foreign employment as a long term option for securing employment opportunities for the village population. 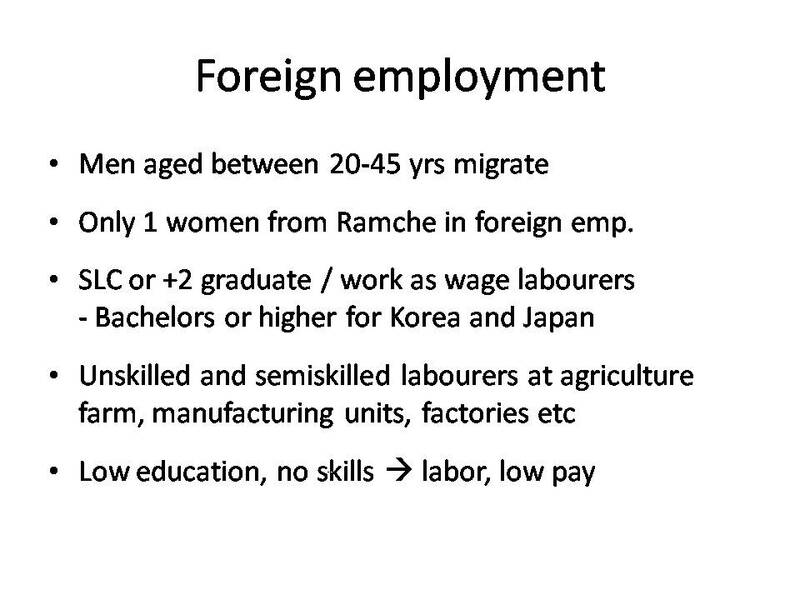 Lack of education and skills is the major concern for those people perusing employment abroad. While most are working as unskilled wage laborers abroad, they earn less and have fewer opportunities for saving and investment as most of their income is spent on covering household expenses, repaying loans and education of children. Further, there are no opportunities to exercise their learned skills and implement them on local enterprises. Lack of entrepreneurial skills further drive them towards vicious circle of searching for employment abroad. Thus programs are needed to enhance skills of workers who opt for foreign employment. Similarly, conducive environment must be created to generate local jobs, impart entrepreneurial skills, and provision of credit facilities. Further, migration have helped secure household condition of the village primarily through improved financial status, access to health and education and increased participation of women in social activities. Never-the-less, prolonged absence of family members could result in family tensions and break up in the long run. 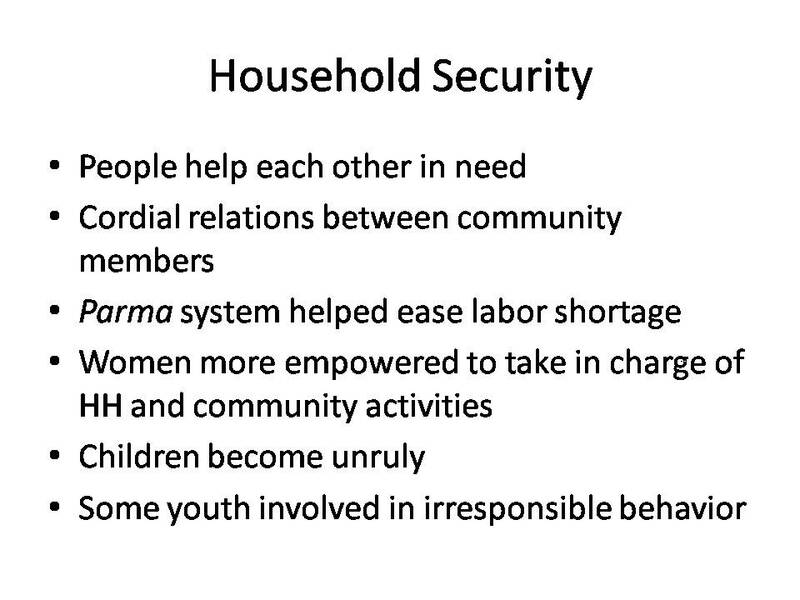 However, heterogeneous community comprised of closely related kins and social relations has provided a safety net for family integrity and social cohesion. The most memorable part of the 2 week rural internship was the painstaking hardship we faced during data collection throughout the day and the sharing of our experience in pleasant manner in the evening when we all used to gather in a camp-fire site and enjoy our achievements on the day. I personally felt the growth in my patience and the adaptation capacity to the changing environment. I realized how much important is it to know the basic environment and way of local life of the village or study area when a researcher or any student is visiting with academic purpose. This experience and opportunity has equipped me with skills and knowledge to conduct such internship for my coming generations. My internship stay in Nangi carried fully an academic purpose but I got to widen my horizon of understanding towards general people in many ways. During interviewing and focus group discussion, I was well informed about their high dependency on remittance and their desire to live a luxurious life in coming days. That made me realize how vulnerable the village people were in long term. I saw the sustainability of remittance economy as the potential sector to conduct research in coming days. Study for the internship at Nangi was a new experience for me and has provided me an opportunity to learn on qualitative research and on quick assessment of rural livelihoods. One of the achievements of this internship was that within short time and limited resource persons, we were able to collect all necessary data required for preparing this report. Under the thematic topic of migration, I made special emphasis on general migration trend of the village, and impact of migration on employment and household security. Similar to the national migration pattern, Nangi village was also seeing migration of significant number of youths for foreign employment. Such migration has definitely helped ease the pressure on agriculture and increasing unemployment in the village and provided income opportunities to the households. 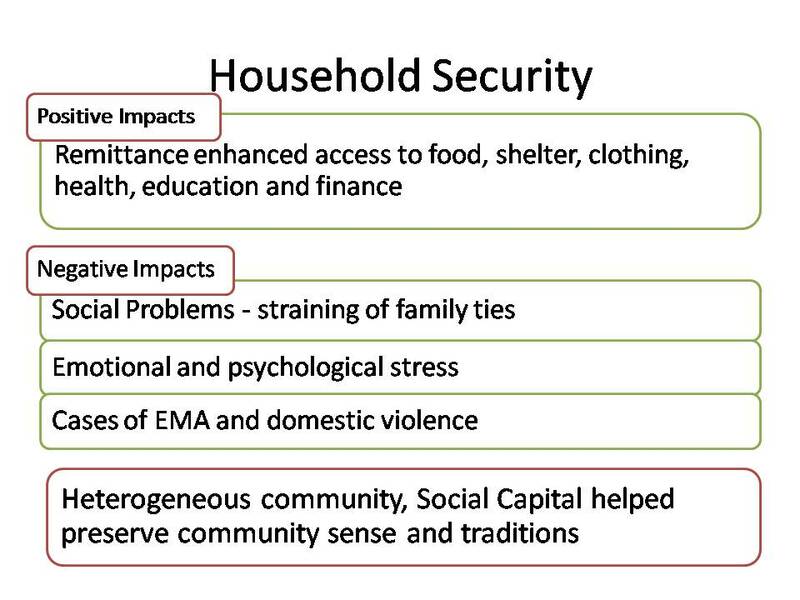 Remitted income in the one hand has helped gain household security through increased access to food, education and health, and on the other hand been a cause for family dispute and straining of relations. Providing skills trainings and encouraging entrepreneurial activities in the village would provide better employment opportunities abroad and in the village. 1.1. During certain times of the year, do any people in this community temporarily leave to look for work elsewhere? 1.2. At which time of the year do they normally migrate? 1.3. Where do most of them go? 1.4. What age group of the people who find seasonal work outside the community? 1.5. What type of work do they look for during these times of the year? 1.6. Since, 2006 have more people moved into your community, or have there been more people that moved away? 1.7. What would be the trend of migration in future years? 1.9. 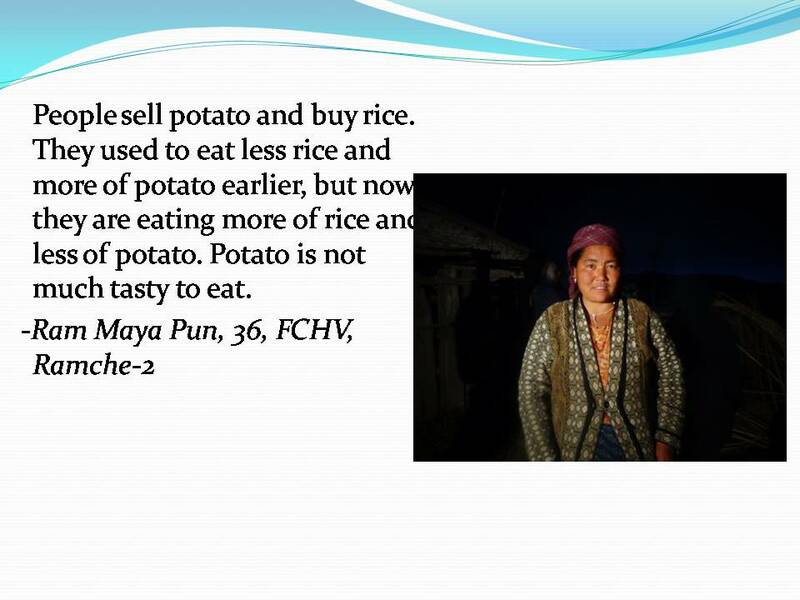 How has remittance affected food security and nutrition status of households?. 1.10. Why do you think people spend remitted amount in real estate or other unproductive assets? 1.11. Are additional laborers hired for agriculture purpose? 1.12. Why are they hired? 1.13. From where do the laborers come from? 1.14. What kind of agriculture are they hired for? 1.15. 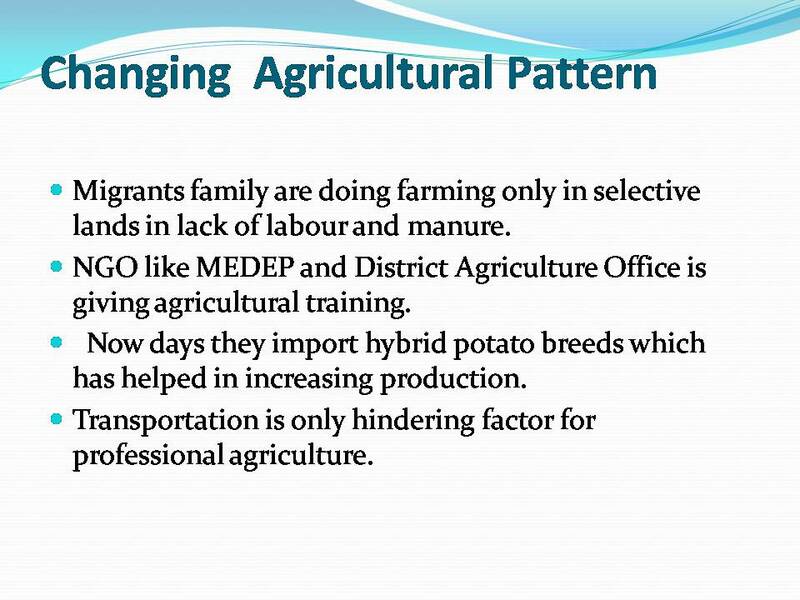 Has they brought any changes in pattern of agriculture? 2.1. How much money they invest for food? 2.2. How has migration affected household and political, security? 2.3. How far they have to go to buy food items? 2.6. How much do you skip you mean per week? 2.7. How much land do you have for cultivation? 2.11. Do you hire? How do you fund extra labor? What is the problem that made hire additional labor? Is there any impact of hiring extra labor on productivity? 2.12. 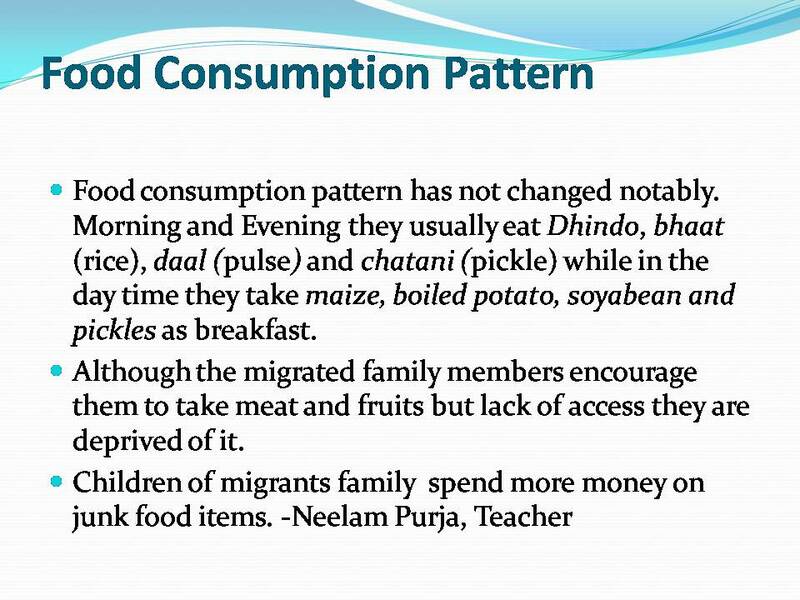 Has the fooding habit changed due to migration or increased remittance? 2.13. How far is the food market? Does market sufficiently supplies food market? 2.14. 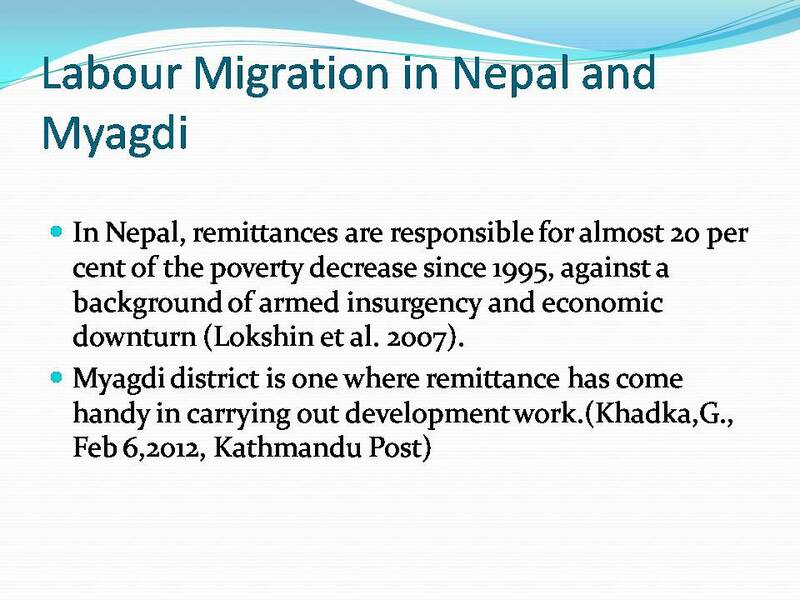 Have people left to work in field due to remittance? 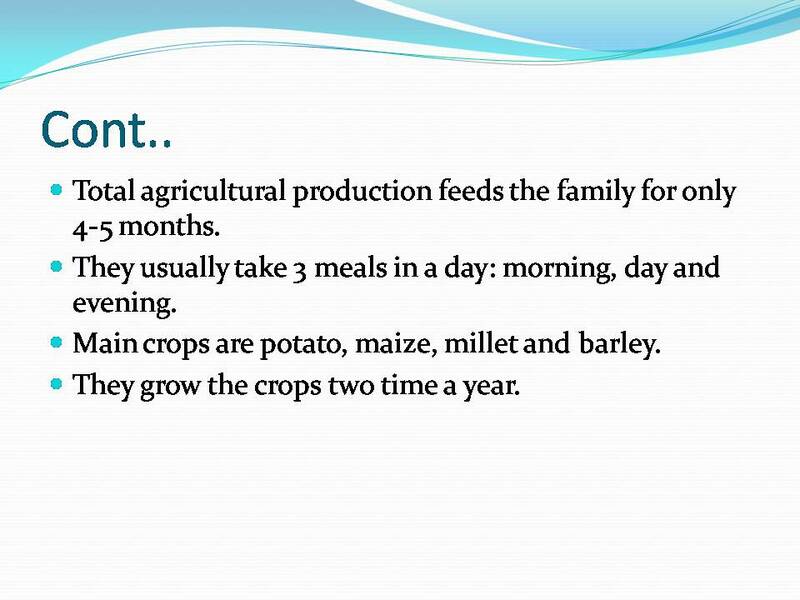 4.6 How much income do you earn from farming? 4.5. Does the family have access to cooperatives or banks or any financial group or institutions? 4.6. Do any of your family members have returns on savings or investments? 4.7. Do any of your family members have life insurance? 4.9. Do you have debt? For how many year? How much? 4.10. Have you experiences any financial crunch or shock in past five year? How many times? 4.11. Do you have remittances as a source of income ? 4.12. 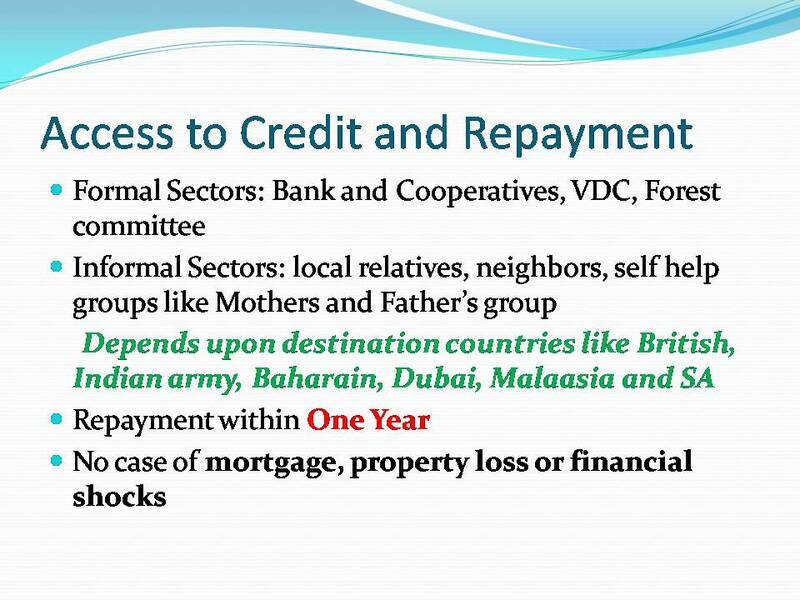 What is the status of remittance remitted by migrants? 4.13. What is remitted amount usually used for? 4.15. 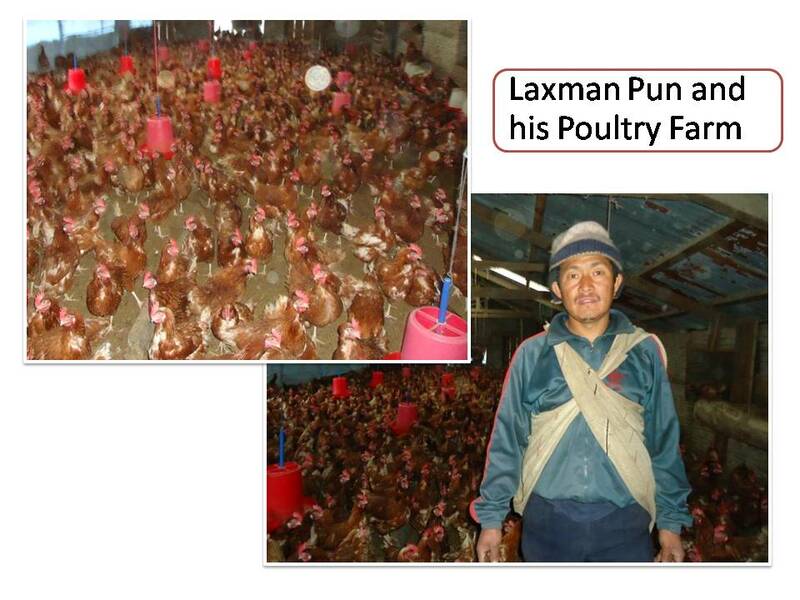 Do people invest remittance in agriculture improvement or businesses investment? 4.16. Do people save remitted income? 4.16.1.1. (If yes) On what type of business do people invested remitted income in? 5.1.1. Has education played role in migration of people? 5.1.2. Where do educated youths migrate most and for what reason? 5.1.3. What kind of job they do abroad? Relate this with the education level of migrants. 5.2.2. Have the performance of the students changed in the school (relate with the marks)? 5.2.3. Has the school attendance changed in last five years? How? What about the attendance of the children from migrant’s family? 5.2.4. Is there any role of migration in affecting the literacy rate of women? How? 5.2.5. 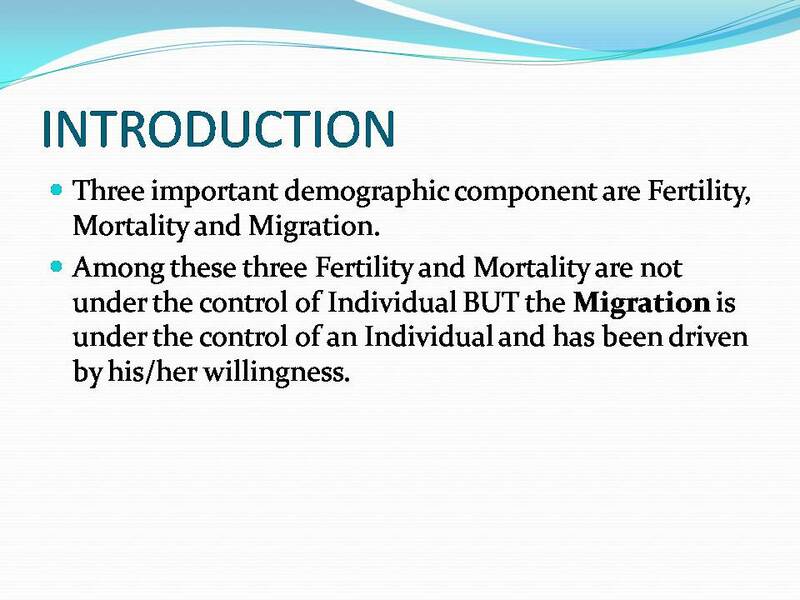 Has the attitude of male towards female in the family changed with the migration (relate with education)? 5.2.6. Where do the migrant send their children for study? In village school or outside? Why? 5.2.7. If children are sent to other places for study purpose (financed by the remittance), what are the chances of them settling there? What is the existing scenario? 5.2.8. What is the impact of pursuing education outside on the village? 6.1. 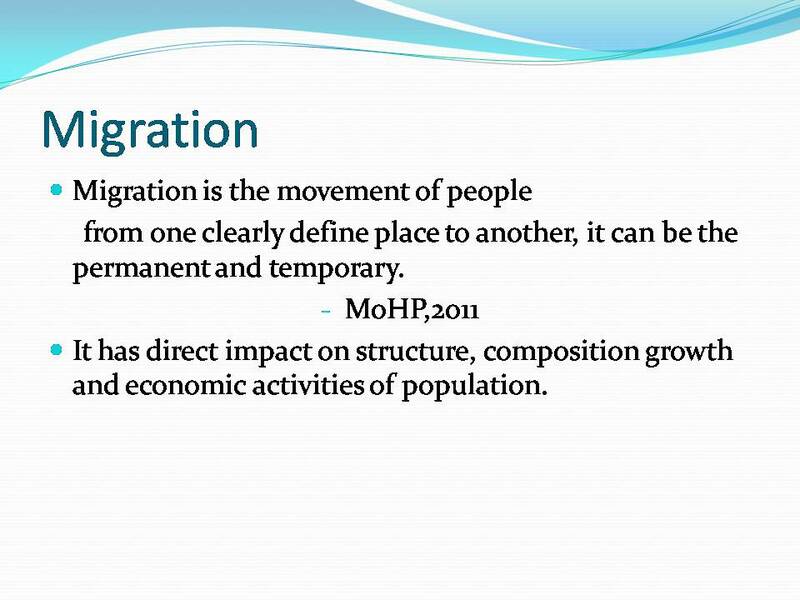 What is the role of migration in improving the health of local people? 6.4. Has the child/ maternal mortality reduced in migrants’ family? Is there any role of migration? Have the birth weights of infants in migrant’s family improved? How? 6.7. Do you have latrine facilities? What type of latrine? When was it build? How did you fund? 6.8. Has the frequency of diarrhea, fever, stomachache before and after the migration changed? If yes, what do you think are the reason? What do you do to treat that disease? 6.9. What kind of other diseases have the family suffered from in past one year? What has been done to cure? How are those expenses funded? 7.1. Do you think you have employment opportunities in the village? 7.2. What are the various factors that you think is important to ensure you employment? 7.3. 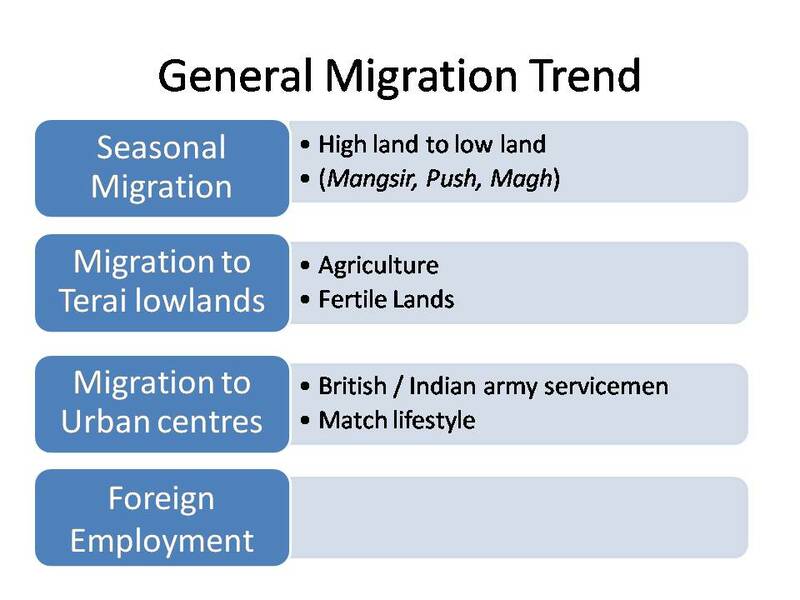 Has migration resulted in lesser economic activity and ultimately affecting local employment opportunities? 7.4. 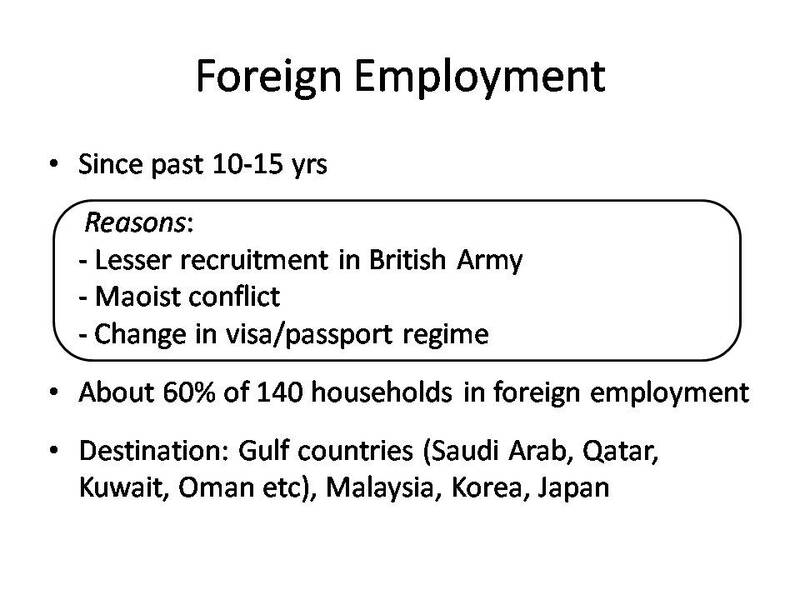 Have the migrants been engaged in long term employment opportunities or prefer seasonal migration for employment? 7.5. Do people who return from abroad try to implement their skills and experiences in creation of employment and business?? 7.6. What could be done to encourage returnees to invest their skills locally? 7.7. Would creation of local employment opportunities reverse the migration trend? 8.1. How has family structure been affected by migration? 8.3. Has the increased migration of youth affected overall security of community? 8.4. Do elderly feel insecure and dejected due to prolonged absence of their children? 8.5. 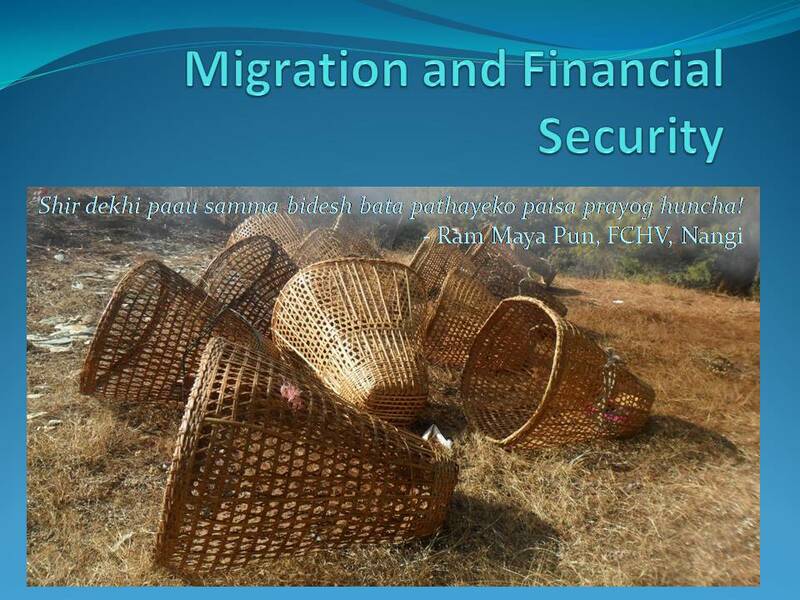 Has threats of theft increased with increasing remittance and migration? 8.6. During the post-peace period since 2006 has the community life been normalized? 8.7. How has migration affected social relationships and community bond?